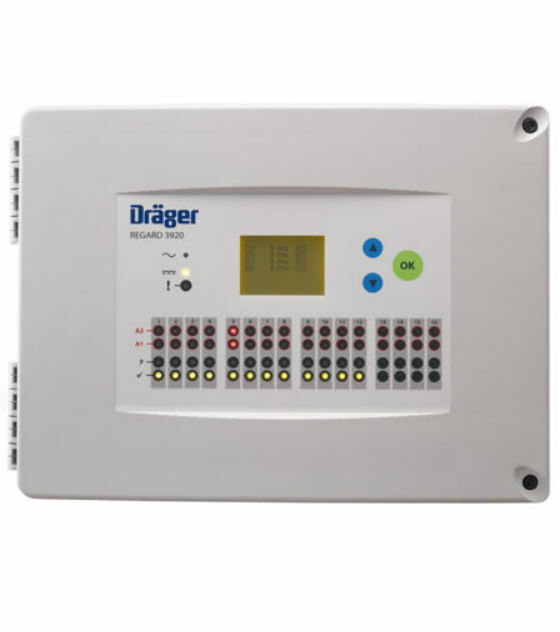 The devices of the Drager Regard 3900 Series can be used as standalone controllers. You can configure up to 16 measuring channels. In addition, the modular setup enables you to customise the control units to the demands of your plant. You can also embed further features to existing alarms. You can connect up to four 4 to 20 mA transmitters with 2 or 3-core cables to an input module. Up to a total of four input modules per controller can be installed. Each module is populated with three relays. These relays offer common "Fault", "Alarm 1" and "Alarm 2" SPOC outputs. In addition, the two alarm levels are fully configurable and can be set as rising or falling and latching or non-latching. A third alarm is possible by using the relay module. You can add two relay modules to the controller of the REGARD 3900 series. Each module is populated with eight relays. The first relay is dedicated as a "Fault" relay and cannot be reconfigured. The remaining seven relays can be configured as "Single", "Common" or "Voting" alarms. An additional "Alarm 3" is offered by the relay module along with a second fault threshold. You acknowledge the alarm relays via the push buttons on the front panel. The relays work with open-circuit current or close current. Each 4 to 20 mA output repeats the signal of up to eight inputs. This allows indication or recording of gas levels by other control units. You can install up to two analogue output modules. You configure your control unit quickly and easily with the configuration software Config 3900 via laptop or PC. For new installations the configuration is prepared offline and uploaded during the commisioning. For maintenance you can download the system configuration for a check. You can get the neccessary cable as an accessory. By using the push buttons on the front panel, the REGARD 3920 can be easily adjusted. The configuration menu is easy to understand. The robust housing of REGARD 3900 and 3920 is dust-tight and protected against water jets (IP 65). Thus these control units can be installed in safe area. The REGARD 3910 is equipped with built-in display and backplane. You can easily mount it into a cabinet. The modules can be intalled there as well. The REGARD 3900 Modbus Gateway is an interface that converts a CAN bus protocol into a Modbus RTU protocol. Due to this factor, the gateway allows the communication between the control unit of the REGARD 3900 series (CAN bus) with RVP 3900 (Remote Visualisation Panel) or other systems (Modbus RTU). Other possible gateways are: Modbus TCPIP and PROFIBUS® Gateway. You can use these to transfer data to third party control systems.